(SPOT.ph) The sun's out, and yes, it's scorching-but isn't that what sunblock is for? Call it a hangover from childhood, but there's something about summer that makes us want to take a little extra time each day to do something out of the ordinary. 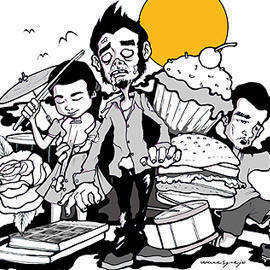 SPOT.ph put together a list of our top picks of things you can do to fill those lazy, sunny weekends. 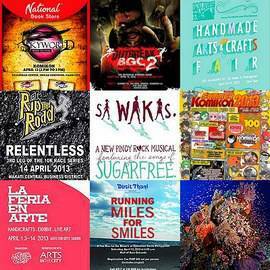 With so many things happening in Manila (and beyond), you're guaranteed an anything-but-boring summer. Taking their cue from New York's food trend of the moment, Manila Pop Up aims to set up impromptu, temporary restaurants offering good eats. Expect to be constantly asking: when's the next one, and what's going to be on the menu? 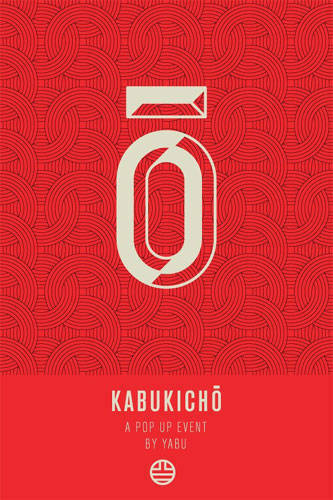 All the mystery has our curiosity-and appetites-excited about Kabukicho, popping up tonight. They make a good point: what better reason to run than having your life depend on it? 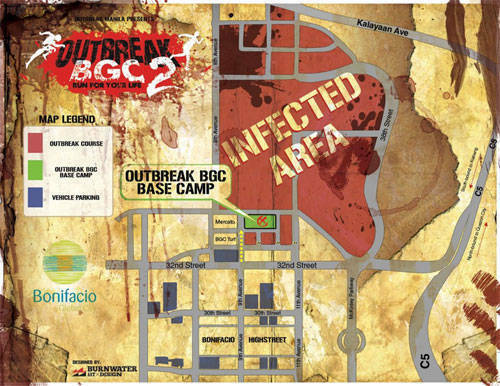 Outbreak Manila turns Bonifacio Global City into Ground Zero of a zombie infestation, turning what would otherwise be an ordinary five-kilometer run into a heart-pounding thrill of an exercise party. 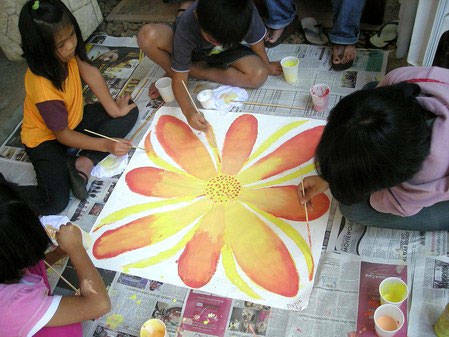 The Giving Hope exhibit, which launched on April 5, features artwork by children from all over the country and benefits the Consuelo Foundation, which works for the treatment and prevention of child abuse. 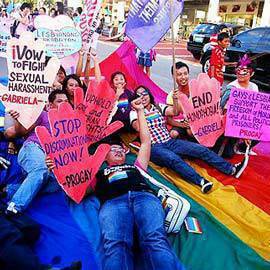 More information: Read more on the Consuelo Foundation, or check out the Ayala Museum website. Instituto Cervantes is hosting Día del Libro 2013 at Bonifacio High Street this month, inspired by a Catalan tradition of exchanging book for roses on this particular day. Día del Libro will be a day of music, poetry, and dance, along with a book market-roses can't be exchanged for books, but they will be sold at discounted prices. When: April 20, 1 p.m. to 8 p.m. Sample a little bit (or a lot) of everything at Best Food Forward, a food fair that celebrates entrepreneurship and eating-and how well the two go together. 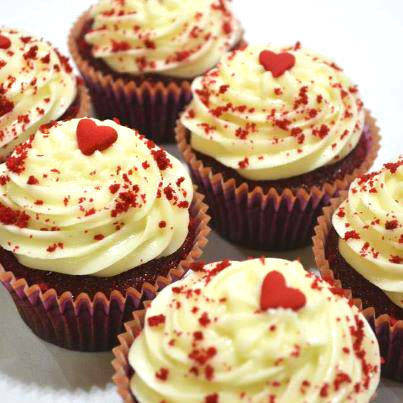 The fair will feature up-and-coming food sellers together with old favorites like Carlo's Kitchen. When: April 20 to 21, 10 a.m. to 8 p.m. 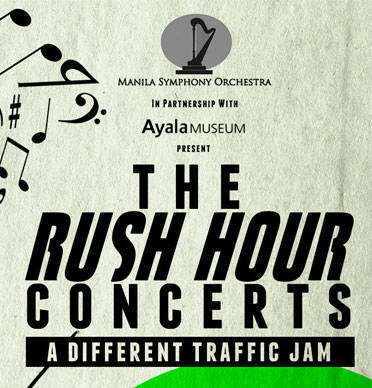 The Manila Symphony Orchestra performs classics by greats like Haydn, Debussy, and Rameau on specific dates at Ayala Museum throughout the summer, offering a different way to shake off stress after work hours. Soothing music or the sound of honking car horns? We think it's a no-brainer. When: April 18, May 2, 6:30 p.m. to 7:30 p.m.
We're not sure what brought it on, but we're not complaining. 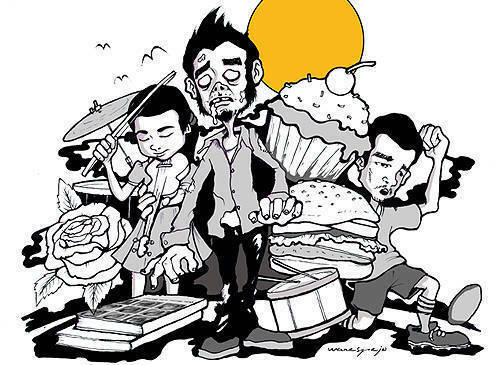 Music fests seem to be sprouting left and right in Manila lately, providing a great excuse for music fans to take a day to tune out (or in this case, in), hang with friends, and relax. Two examples to look forward to: Wanderland in Circuit Makati and, while it's not in Manila, Summer Peace Festival 13 (SPF13) in Zamboanga and Cagayan de Oro is worth checking out because it's not just about entertainment, it also aims to promote peace in Mindanao. 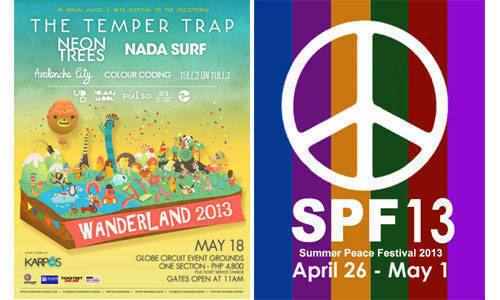 More information: Log on to http://summerpeacefestival.com/ for more info on SPF13; go to http://www.facebook.com/wanderlandfest for more on Wanderland 2013. Say hello to Mrs. Robinson with Repertory Philippines' production of The Graduate, starring Pinky Marquez. Based on the 1963 novel by Charles Webb, the story (if you didn't already know) revolves around Benjamin Braddock, fresh from university, and his brief liaison with the older, sexually sophisticated Mrs. Robinson. Things get tricky when Braddock falls in love with a girl who turns out to be Mrs. Robinson's daughter. 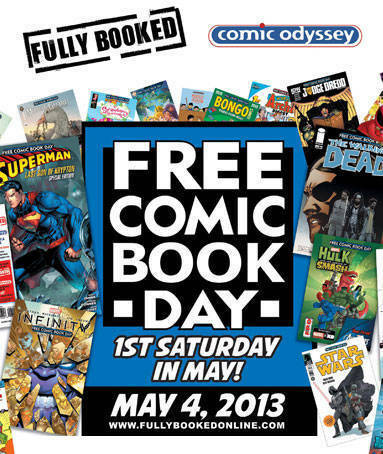 Free comics are up for grabs on Free Comic Book Day at Fully Booked in Bonifacio High Street! Each person gets three free comics at that particular store, while the rest of the participating Fully Booked branches are giving away one comic per person. Some graphic novels will be 20% off. When: May 4, from 10 a.m. The Philippine Volcanoes takes on Hong Kong and UAE in their home games for the HSBC Asian 5 Nations, to be held at Rizal Memorial Stadium. Adrenalin rush plus athletic eye candy? Total win. When: May 4 (vs. Hong Kong) and May 18 (vs. UAE), 7 p.m.